Temporary decorative LED lighting is now brightening the underside of the Norfolk-Southern overpass that crosses Barr Street just north of Freimann Square. The 2018 Draft Annual Action Plan outlining how the City of Fort Wayne will invest U.S. Housing and Urban Development (HUD) dollars this year is now available for public review. Residents can view the plan online at www.FWCommunityDevelopment.org/actionplan or can read a hard copy during normal business hours at the Pontiac Branch of the Allen County Public Library, 2215 S. Hanna St., and at the front desk of the City’s Community Development offices, 200 E. Berry St., Suite 320. The plan will be presented at a public meeting scheduled for Wednesday, July 18, 2018 at 6 p.m. at the Community Center, 233 W. Main St. 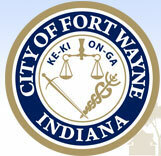 The annual report detailing how the City of Fort Wayne invested U.S. Housing and Urban Development (HUD) dollars in 2017 is now available for public review. Comments regarding the report, called the Consolidated Annual Performance Evaluation Report (CAPER), will be accepted at a public meeting on June 13 and in writing through June 18, 2018. The public meeting is scheduled for Wednesday, June 13 at 6 p.m. at the Fort Wayne Parks and Recreation Community Center, 233 W. Main St. The City of Fort Wayne’s Urban Enterprise Association (UEA) has hired Trois Hart as its new Director. Hart replaces Gina Kostoff who recently took a position with Indiana Michigan Power. Hart joins the City of Fort Wayne with a career history in banking and most recently as the Associate Vice President of Marketing at the University of Saint Francis. She serves on multiple community boards including the Fort Wayne Downtown Development Trust and the Community Foundation of Greater Fort Wayne. Hart reports to the UEA Board of Directors and to Cindy Joyner, director of Community Development.